At Fresh Produce Ukraine 2011, Masterpak will join growers, farmers, import/export firms, processors, as well as local and international suppliers of the fruit and vegetable sector in Ukraine and the Commonwealth of Independent States (CIS). Lebanon-based polyethylene (PE) film manufacturer, Masterpak will learn more about Ukraine’s fresh produce industry at the annual international exhibition for fruit and vegetable production, processing, handling and storage for Ukraine and the CIS. 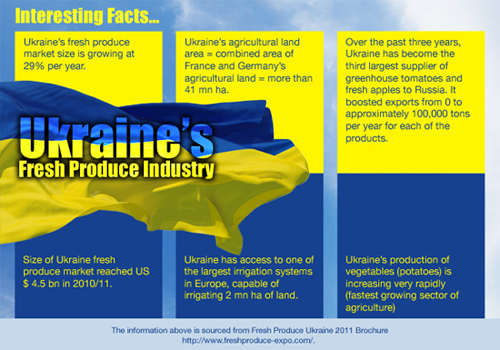 Fresh Produce Ukraine 2011 will take place at International Exhibition Center (IEC) in Kiev, Ukraine from 30 November – 2 December 2011. By attending the event, Masterpak aims at keeping in-tune with the latest developments within the emergent Ukrainian fresh produce sector. The agricultural PE film manufacturer seeks to develop symbiotic business relationships with other players in the fresh produce industry. Interested parties can request a meeting with Masterpak representative, Rani Sfeir, Market Manager for Agricultural Films. Masterpak manufactures, for the fresh produce sector, agricultural and horticultural PE films, such as compost and forage bags, grapevine cover film, greenhouse plastic, ground cover film, hydroponic gully film, low tunnel film, mulch film, protective bags for banana cultivation, silage cover, soil disinfection film, and water membrane for Europe, Africa, the Middle East and beyond. Fresh Produce Ukraine 2011 is organized by CoD Exhibitions Ltd., Ukraine, and co-organizers Fruit-Inform, Ukraine, and BTO Exhibitions BV, Netherlands. The event will host Fruit-Inform’s eighth international conference, "Fruits and Vegetables of Ukraine 2011". The 3-day trade event provides a platform for the complete fruit and vegetable industry bringing together key clients from Ukraine and other CIS countries, as well as other exporters/importers, and suppliers from around the world.